One lovely summery day, I (Jenny) was going to go to St John’s Methodist Church. And this is what happened. On Palm Sunday, I had to wake up extremely early because I had to be at the Church for their service for Palm Sunday. After I had finished my breakfast, I was groomed and then my owner led me into my convertible stable. We were on our way to the church. Once we arrived I had to wait till the boy who was going to ride me finally came. A couple of moments before this, I was allowed to go out and enjoy the sunshine and while I was enjoying the sunshine, some children came to stroke me (even though they didn’t realize I was 30 years old!) After 15 minutes, the service had begun and I would be going in soon! “In 2 minutes,” shouted a smallish woman quietly. After those 2 minutes I was off! I walked into the church, up one way and down the other. When I came out, I was hoping I was going to go back in. 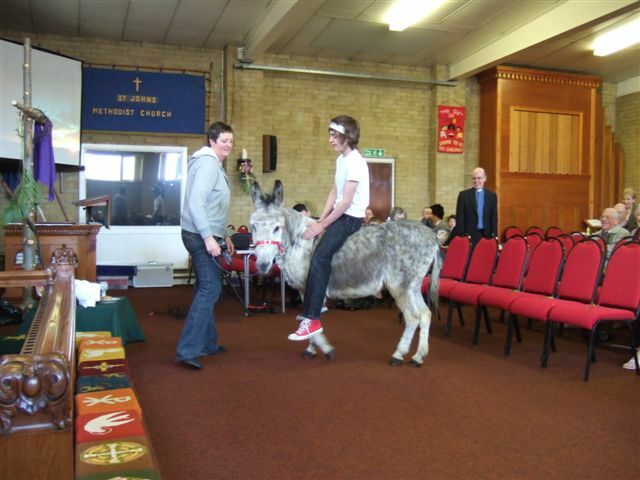 After approximately 30 minutes, I had to trot along the side of my owner back into the church. The minister was thanking all three of my owners and other members of the church for letting me come to this wonderful church. P.S.I hope I can come back soon.